A insightful incursion into the lives of sperm whales shows just how similar these gentle marine giants are to us. Not only do these highly social animals communicate through a language, made up of patterned sets of clicks called codas, but they also have dialects. These dialects may be unique to each clan of sperm whales, which may include thousands of individuals. Moreover, the language is learned and not inherently transmitted – a prime example of culture, if anything else. Underwater photographer Franco Banfi captured these amazing images of the 45 tonne mammals swimming close to the island of Dominica. 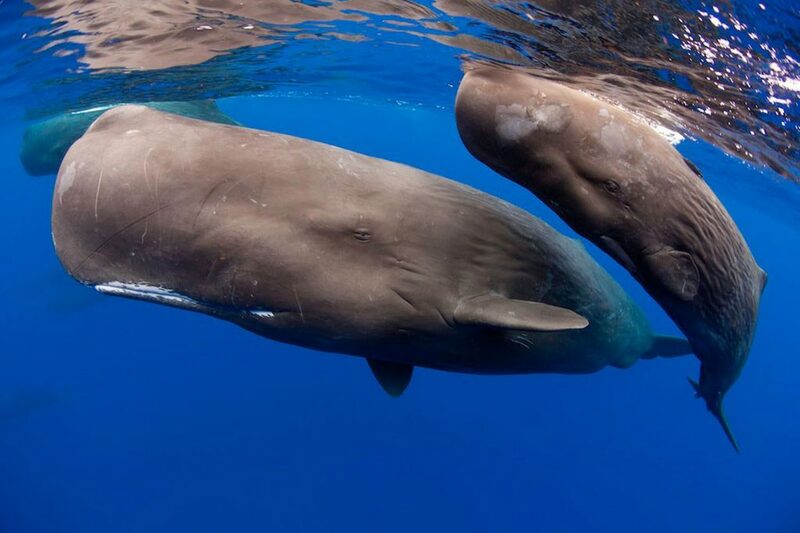 The findings were made by researchers at the Dalhousie University in Halifax, Canada who closely followed clans of sperm whales off the Galapagos Islands in the eastern Pacific. The scientists carefully recorded and analyzed the whales’ codas, which sound very much like Morse code as the clicks vary in rhythm and tempo. Two clans particularly stood out. In one clan the pattern of clicks were regularly spaced, but in the other the codas had an extended pause at the end before the last click. But do they understand each other? To a degree maybe, but unlikely. An important question the researchers wanted to answer is whether the ‘clicking’ ability to communicate with distinct codas is inherent or attained. So they built two models in which virtual sperm whales lived in a simulated environment analogous to the real one. “In one of our scenarios, we had genetic transmissions of codas from mothers to their calves; and in other scenarios we had whales creating their vocal repertoires on their own or learning from each other,” said PhD student Maurício Cantor. Is this direct evidence that sperm whales form a culture – maybe the first in the animal kingdom besides human society? It’s a complex question in biology today and “it all depends on how you define culture,” says Cantor. These findings are amazing, neverthless. They show just how complex these animals are, and given how social they are this might not be that surprising when you ponder it. Just look at us, there might be a correlation between our extraordinary ability to communicate and our intricate social structure. The whales dive the deepest and longest, plus they have the largest brains, largest noses, and the most powerful sonar in the animal world. “All of this makes them very effective predators, but also very cooperative and social creatures,” says Cantor. Both genders are sexually mature in their early teens, which is when many males leave their natal social unit. Males spend the next 15 years wandering, generally moving to colder and colder waters; they range from pole to pole. But sometimes, males will form a bachelor clique. The females, on the other hand, never leave their social unit essentially comprised of mothers, grandmothers, daughters and pre-teens. The beautiful sperm whales almost got hunted to extinction, being valued for their oil. While international banning has mostly pulled the plug, some illegal harpooning still takes place. Pollution, chemical dumping – particularly heavy metals like mercury – and trash (whales regularly get trapped in fishing gear) are the biggest threats sperm whales face today.